We took a trip to the art museum this weekend to catch the Frank Lloyd Wright exhibit before it closed. On display around the main entrance were a number of sculptures promoting the upcoming China exhibits. "The Emperor's Private Paradise", starting June 11, will feature over ninety objects from the Qianlong Garden in Beijing, never before seen by the public. Only three museums in the world will feature this exhibit. 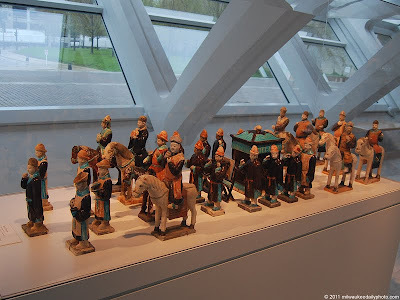 Today's Photo is of a Ming Dynasty model of a funeral procession. The detail of the figurines and the fact that there are so many indicate that this probably came from the tomb of someone with very high social status.